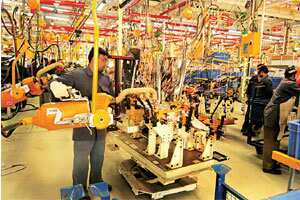 Building block: Workers at a Mahindra Logan facility in Nashik. Mahindra System and Technologies (Systech), the business unit comprising the various auto component manufacturing companies of the Mahindra Group, India’s largest tractor and utility vehicle maker, plans to start selling sub-assembled components to improve profitability. “We are aiming to improve operating profit of each of our companies by 200 basis points annually for the next three years," said Hemant Luthra, president, Systech, Mahindra and Mahindra. Mahindra Forgings Ltd, a Systech group company, had a turnover of Rs2,001 crore and operating profit margin of 12.24% in 2006-07, whereas rival Bharat Forge Ltd, the country’s largest forging company, had a turnover of Rs4,148 crore and operating profit margin of 17.6% in the same period. Mahindra Ugine Steel Company Ltd, another company under Systech, had net sales of Rs716.43 crore and operating profit margin of 13.5% in 2006-07. “Instead of doing components, we can do sub-assemblies," said Luthra. “We need to do more value addition if we have to improve our margin." The company wants to move into sub-assembly gradually in the next three years. The Mahindra Group has been a late entrant in the component manufacturing business as it started operations only in 2004 under Systech. The business unit aims to generate $1 billion in turnover by 2010 with aggressive plans for acquisitions. The unit has already achieved a turnover of $785 million in 2006-07. The Mahindra Group hopes to list more Systech unit companies by 2010. Apart from Mahindra Forgings, the group has stamping, casting and similar services provided by companies such as Musco Stampings, Mahindra Hinoday and Mahindra Composites. The group also has a gear manufacturing company. Systech is aiming to provide a one-stop solution to vehicle makers to improve itsoperating profit margin and is looking at the Indian and European markets, besides other opportunities to grow its sub-assembly business. Mahindra Forgings—which started two years ago after the group acquired Amforge Industries Ltd, Pune—has also acquired Stokes Forgings in the UK, besides Jeco Holding AG, and Schöneweiss GmbH in Germany. The company has grouped the three European companies together under Mahindra Forgings Europe. “We are expecting the three European companies to together perform 15% better than expected this financial year," said Luthra. The three companies together reported €315 million in turnover with an 11% operating profit in 2006. The companies were expected to improve their turnover by 7-8% and operating profit by 1% in 2007. Now, they will do 15% better on this in both in terms of operating profit and turnover. The aggressive acquisition plan for growth is still something the company will explore, albeit at a slower pace, said Luthra. “Initially, we had no option but to grow inorganically, but now we are in no hurry," he added. The company is currently targeting four privately held design companies, two each in Germany and Italy. Luthra did not give any time frame or the value for the proposed acquisitions.